Published on March 28, 2009 in People. Closed Tags: People, Phyllis Townsend, Will Townsend. · The way people have opened their hearts and homes to us. · The importance given to the authority of the Bible, striving to understand and interpret its whole message, in contrast to narrow line-by-line or “literal” interpretation. · Emphasis upon the one-ness of love-for-God and love-for-neighbors (that is, all of humanity). We appreciate Father John’s phraseology that “Love for God and love for our neighbors are inextricably intertwined. · The fact that, by choice, Holy Cross is a vital part of the Weare community. · The acceptance of diversity of liturgical practices, such as sitting, standing, kneeling for prayers, diversity of opinions, such as around the issue of sexuality. We are happy that Holy Cross is “home” to us! Published on March 28, 2009 in People. Closed Tags: Harold Beliveau, People. 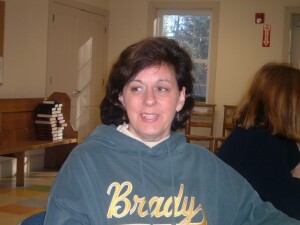 My wife Kathleen and I became acquainted with Holy Cross some 15 years ago when we supported the effort of St. Paul’s, Concord, that had an extended and helpful ministry at Holy Cross. We were impressed by the worship and work of the clergy and people at that time. Published on March 28, 2009 in People. Closed Tags: Bobbi-Jo Plamondon, People. I have been coming to Holy Cross since I was a little girl. I was one of the very first female acolytes, in the old church which is now the atriums. I’m a single mom with two little boys, Ryan and Wyatt. I have lived in Weare most of my life, aside from a few years in North Carolina in my early 20’s. I actually found my way back to Holy Cross during my pregnancy with Ryan. I will say it is so exciting to be in our new building. To be able to provide a community space for so many groups in town is wonderful. I think back to how many changes we have had over the years, but the closeness you feel here never changes. I love the atrium and nursery program we have. It is so different than what I experienced. I think my children will remember more with the program we have here now. I love it here, and I’m proud to be a part of all we try to do for the community and beyond. Published on March 28, 2009 in People. Closed Tags: Laura Arvin, People. I came to Holy Cross, a little more than eight years ago. When I called to find about service times, I got the answering machine. The message, offered by Fr. 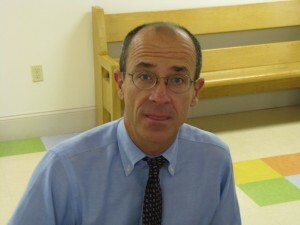 John, spoke of a small congregation with lots of young families with children. Right down my alley—I had a 5-year-old and an 18-mo.-old. I was shopping for a church home after having moved to New Boston recently. I was starting with Episcopal churches—I had grown up in one. Richard Harbour joins Bishop Gene Robinson at a Holy Cross potluck dinner. Richard likes to describe himself as a doer, not a planner. Which is a great orientation for the Property chair on the Holy Cross Vestry. Though he’s in sunny Florida for the winter months, for most of the year Richard is right on top of all the building and grounds jobs that need attention: painting, gutting the old basement, washing windows, grooming the grounds. Richard is a retired sales representative, who lives with his wife Ellie in Hillsborough. When we want something done, we ask Richard! Everyone should be so lucky as to have a guy like him on hand. Susan likes to say that when she first started attending Holy Cross we had just installed indoor plumbing! Besides serving as one of our “memory repositories” (she is on the parish history task force) and as head of the Altar Guild, Susan is currently serving on the Vestry as our Diocesan Liaison chair. Combined with her role as one of our delegates to Diocesan Convention, this means that she is responsible for all of the ways in which we interface with diocesan programs: Safer Church minister, coordinator of the Gifts to Children of Prison Inmates program, and more. Susan retired at the end of 2008 (hurray!) has a grown daughter and son, and an adorable granddaughter who sometimes comes to church with her. 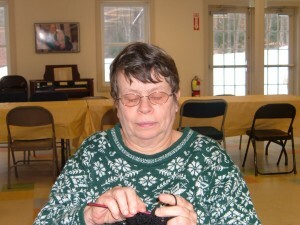 She’s pictured knitting a prayer shawl for our prayer shawl ministry–through which we give comforting shawls to those in the congregation or the wider community who are ill or facing surgery. 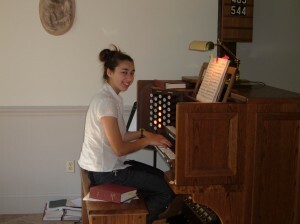 Six or seven years ago one of our musicians, the folk singer Douglas Clegg, suggested that Holy Cross begin a program of supporting an “organ scholar.” Organ scholars would be teenagers who wanted to take organ lessons–the organ being the most difficult and sophisticated instrument a musician can aspire to play. Since organists are something of a dying breed, we thought Douglas had a great idea. His suggestion was taken up enthusiastically by our other two organists, Liz Black and Roberta Walmsley. Mary at the console of the Holy Cross organ. Our second organ scholar is Mary Copeley. Mary is a home-schooled high schooler, looking towards a career in organ. She is one dedicated and accomplished young lady, having been selected in a natinal competition last year for a summer “organ experience” intensive music camp–one of just 20 young people to be chosen. Lest you think organists are some sort of weird wonks, know that Mary also plays in a rock group, enjoys sports, and otherwise exhibits the marks of a regular teenager. Mary is a faithful member of St. Mary’s Roman Catholic Church in Manchester, so she often does double duty, fitting in service there as well as at Holy Cross. Published on March 1, 2009 in People. Closed Tags: teens, Youth. Published on March 1, 2009 in People. Closed Tags: family, members, People. Published on March 1, 2009 in People. Closed Tags: Children's Formation, members, People.